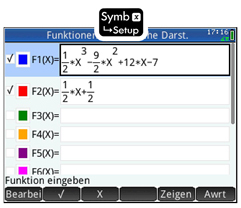 In the symbol -view the function terms are entered and the colors for the graph definded. The test functions are activated by tick box. 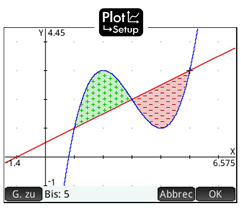 area between two graphs or graph and x-axis. 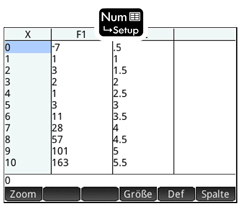 In the Num -view the corresponding value ​​tables are displayed. With a flick of the finger on the multi-touch display can be comfortably scroll through the tables of values​​. Using the "Zoom" function can be "refined" arbitrarily the value tables.